Every summer as kids, we would host one group of cousins or another and jump off hay bales, create mazes by crawling the patterns through the tall grass, and steal green apples out of the garden. We also branded calves, killed chickens, and stole steak knives to threaten skunks with. But that’s growing up on a farm for you. Deanna has published short fiction in Crossed Genres, Big Pulp, Penumbra and more. She lives in Colorado Springs, Colorado. 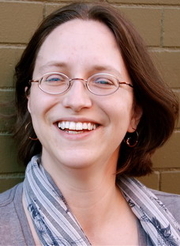 DeAnna Knippling is a LibraryThing Author, an author who lists their personal library on LibraryThing. DeAnna Knippling's book Tales of the Normal was available from LibraryThing Member Giveaway. DeAnna Knippling's book The Clockwork Alice was available from LibraryThing Member Giveaway. DeAnna Knippling's book Alice's Adventures in Underland was available from LibraryThing Member Giveaway. DeAnna Knippling's book A Murder of Crows was available from LibraryThing Member Giveaway. DeAnna Knippling's book Guinea Pig Apocalypse was available from LibraryThing Member Giveaway. DeAnna Knippling's book The Exotics Book 1: The Floating Menagerie was available from LibraryThing Member Giveaway. DeAnna Knippling is currently considered a "single author." If one or more works are by a distinct, homonymous authors, go ahead and split the author. DeAnna Knippling is composed of 2 names. You can examine and separate out names.